Surface Dressing is a quick and convenient method of rejuvenating a surface which is beginning to show signs of fatigue, eliminating the need for replacement and reducing costs. A hot bitumen emulsion is sprayed onto the road surface followed immediately with an application of high quality, washed and graded aggregate. These are then rolled to ensure proper embedment of the aggregate into the binder. This provides an economical and water impervious seal with the added benefit of a much-improved surface texture. sprayers and aggregate spreaders. The object of surface dressing is to create a stable mosaic of chippings securely attached to the road surface; this provides a comprehensive seal to prevent the ingress of water in to the road pavement, and a fresh hard wearing skid resistant surface. It can be used to treat both lightly and heavily trafficked roads and the proper choice and rate of application of materials is essential to ensure adequate performance. This is achieved by spraying the correct amount of bitumen emulsion onto the road surface followed by the appropriate amount of the correct sized chippings according to the softness of the road surface. 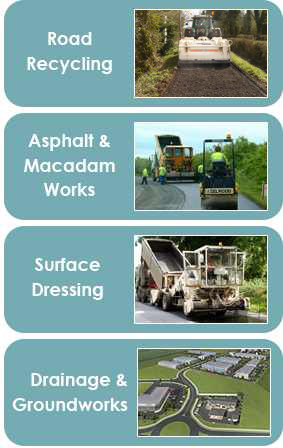 Once you have established the hardness of the road surface, and you know the amount and type of traffic, you need to consult IAT Guidelines for Surface Dressing in Ireland to design the appropriate dressing for the site. This will mean determining the correct size of chipping and the correct rate of spray of binder. 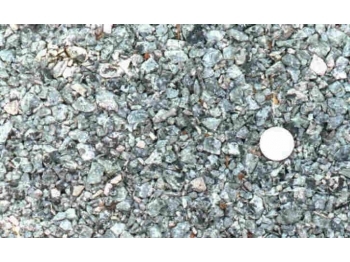 According to site conditions, it will also be necessary to consider the Polished Stone Value (PSV) and Aggregate Abrasion Value (AAV) of the aggregate source, and also the possibility of the use of an enhanced, polymer modified, binder. The cost is substantially lower than for traditional asphalt and macadam surfacing.